Over the past few weeks, many lovely souls have been sharing via Facebook, blogs and e-mails what they are thankful for. And, I am always inspired to dig deep into life, to savor every moment, and to spend a few of those moments reflecting on my own personal blessings, sending an offering of Thanks in the quiet moments of the day or in the quiet moments of prayer. This year the virtue of gratitude has taken on a bit of a different twist for me. I feel my the threads of thanksgiving in my heart being tugged at and stretched, because of the struggles that I have personally been up against and the the sufferings my own family has endured over the past few months. Those burdens wear on you, they wear on your faith, on your sense of hope, on your patience, and even on your will to be gracious, to offer thanks with a cheerful heart. Made in the image and likeness of a God whose mercy, love and generosity is simply immeasurable, we are called to praise Him. blessed be the name of the Lord. Even in the most difficult of circumstances. Even in cancer, in hurricanes, in loss, in defeat, in injury in shame, we offer praise and thanks. Blessed be the name of the Lord. 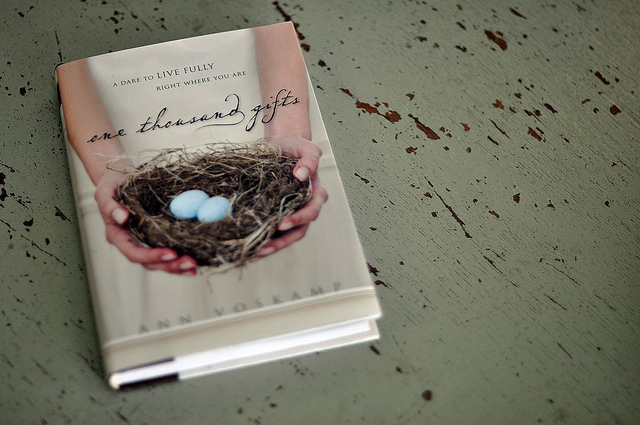 One thousand Gifts is an exploration of the essence of Thanksgiving, of Eucharisteo. Ann leads the reader into the depths of her own suffering, her own questions, her own doubts and fears, and shares with us the graces of understanding that have come to her in her quest for authentic gratitude. I highly recommend the book as well as her blog, A Holy Experience. ~ While I may not always feel joy, God asks me to give thanks in all things because He knows that the feeling of joy begins in the action of thanksgiving. True saints know that the place where all the joy comes from is far deeper than that of feelings: joy comes from the place of the very presence of God. Joy is God and God is joy and joy doesn't negate all other emotions - joy transcends all other emotions. ~ Dare I ask what I think I deserve? A life of material comfort? A life free of all trials, all hardship, all suffering? A life with no discomfort, no inconveniences? Are there times that a sense of entitlement - expectations - is what inflates self, detonates anger, offends God, extinguishes joy? ~ Be at peace. Bend the knee and be small and let God give what God chooses to give because He only gives love. And, whisper surprised thanks. This is the fuel for joy's flame. Pride slays thanksgiving, very correct! My guess was right, you are a believer. Now I am super happy to meet you.